It’s been a little while since I’ve shown some of my thrifty finds, so I thought I’d show you what I found this week. Don’t get too excited, because it’s a short list. Ta-da. This is a footed silverplated bowl that I bought at an estate sale on Friday. 50% off, so it was only $3.00. Doesn’t it look quite fancy juxtaposed against the worn, chippy wood of the bird house? Well, I will admit that I felt a little foolish walking out the door to take these photos. Camera around my neck, silverplated dish in one hand and a piece of bumpy fruit in the other. I was hoping the neighbor wasn’t going to drive down their driveway and ask me what I was taking photos of. A bowl, why do you ask? You see, I used to just take photos of my thrifty finds with the gravel driveway as a backdrop. Just sort of took the items out of my van, sat them in the gravel or the grass next to the driveway and snapped away. Then I started to get all artsy fartsy and try to take photos in better locations. With more interesting backdrops. Now I’m stopping my car alongside the road to pick up some hedge apples, because I can envision them looking cool in the silver bowl that I just bought. Let’s rearrange that hedge apple so that the microscopic piece of dirt on it doesn’t show. Oh, and wow, I can use the yellow tree as a backdrop, so I can take advantage of some of the fall foliage. And then if the leaves aren’t quite in the right spot, I can throw some of them up in the air and see if they land in a more “natural” position on the ground. Where does this all stop? Am I going to try to make my trashcan look more photogenic by dragging it out to the flower beds? And then rearrange the garbage contents so that the macaroni and cheese box is at a better angle? This whole photography thing is getting to be addictive. And slightly scary. BTW, not saying I’ll be stopping the artsy fartsy photos or anything. 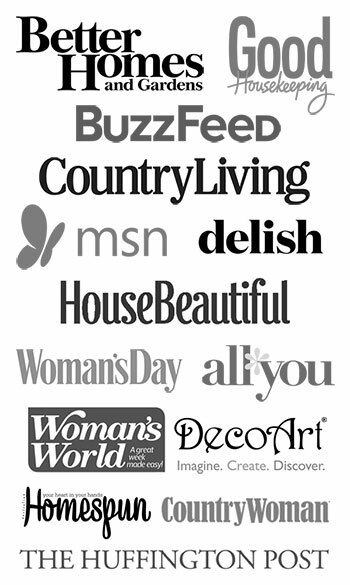 Just an observation on the life of a blogger. Linking with Treasure Hunt Thursday at From My Front Porch To Yours and Farmhouse Friday at LaurieAnna’s Vintage Home. My neighbors have stopped the car and asked what are you doing. One day I had a whole picnic scene going, and they were perplexed because it was in the front yard. 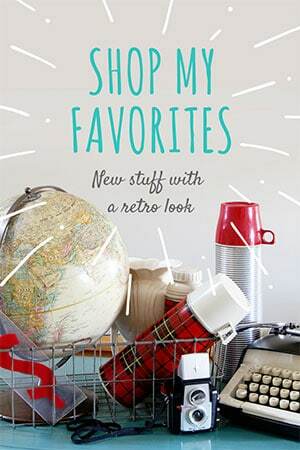 I love your new finds and great photos too. 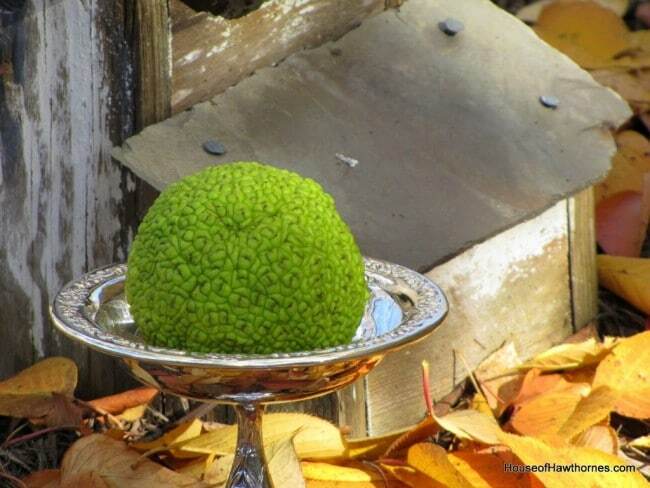 The hedge apple is gorgeous in that silver bowl. Just to let you know I sometimes lay on my abdomen in my yard to take photos so Lord only knows what my neighbors think but really who cares anyway. I also go outside in my pj’s and take photos-that is scary. you are a great photographer! And seriously, a girl will do just about anything for a good photo or a good piece of junk, right?!?! i heart hedgeapples! and that silver compote looks great all polished up! I need to get with the taking better pictures thing… gah… at the moment I’m just lucky to remember to actually TAKE a pic 😉 I love your photos though! I especially LOVE hedge apples… it makes me think of home in the midwest. They don’t have them down here in Texas. I’m imagining a whole dough bowl of hedge apples on a table… it’d be glorious! Thanks for the eye candy! I think mine did. And then I raised the bar by going out in pajamas. It’s all about the perfect picture…hee hee. Beautiful vignette, Pam. LOL about your photo staging. I do that when I’m taking pictures of food. By the way, the silver bowl looks fabulous. Take care. Your so funny! My hubby told me just the other day I was getting all artsy fartsy on him. I told him “I know isn’t it great!” I bet if you did drag your garbage can over it could look pretty amazing! Love your find by the way. It’s so pretty. Well I certainly did enjoy your post and the comments too. Yep, it can be addictive and I find myself now doing some “creative” rearranging of things to get just the right shot. 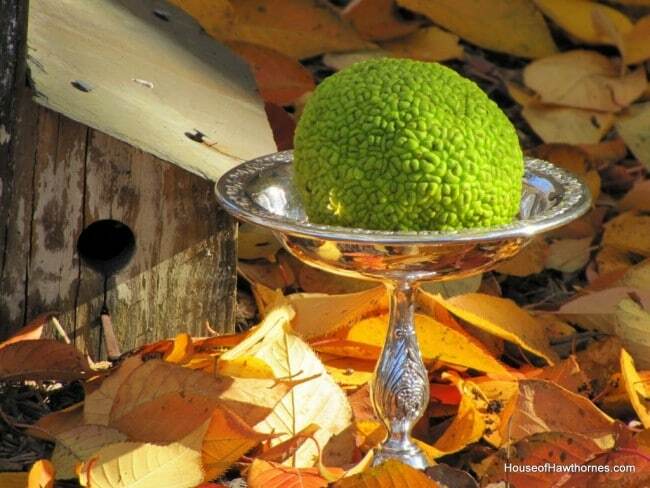 I do find those Hedge Apples rather fascinating and they looked awesome in your silver bowl against the fall leaves and worn birdhouse. I love that pedestal! It’s so pretty and only $3 was a steal. It does look great with the old birdhouse. I don’t think we have any of those Hedge apples around here. The color is really amazing. Haha! I always enjoy your photos, so you’re doing something right! I have a pedestal dish just like that, but my plate is more worn off, so it wouldn’t look as shiny and pretty outside in my leaves as yours does, lol! I love hedge apples and bought some a few weeks ago. I’m trying to dry them. Have you ever dried any? Your photos are really nice. Love your new piece of silver…wonderful price! 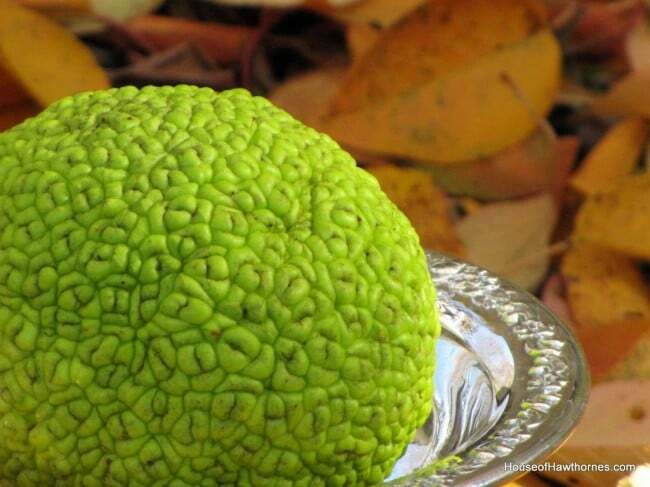 Those hedge apples are so awesome..we have them here, but my hubby has always called them osage oranges…maybe they are a little different, but they look just like yours:) I so need to get some this year. Ya know if ya slice hedge apples and toss ’em under your house, in a storage buildin’ or attic ya won’t have a spider or a mouse problem. Just sayin’. This Ozark Farm Chick does that and it work fantastically. Your pictures are just beautiful! Can ya believe when the ‘lectric guys put up a new generator box yesterday they took down a birdhouse? Really…the nerve of some people! Heeehehehe! God bless and ya’ll have a magnificent weekend strait the happy hills and hollers of the Missouri Ponderosa. I’m so loving your visuals. The beginning is amazing but I really like what you did with the last picture. You have that many leaves still hanging around? Everything is looking mighty stark around here these November days. I laughted at your comment about your neighbor–I’m sure our neighbors think I have lost my mind at times–oh well. It is funny how we can’t just take a picture, no thye have to have a certain look about them or mine get deleted and I do it over. I love your post, so funny! and the silver compote is a great find! I know everyone likes that footed bowl, but I’m really digging that birdhouse. And the things we do to get those photographs! I draw the line, though, about going outside in my pjs! I never knew what those things were called! I’ve called them “monkey brains,” for as long as I can remember! ha ha. Great photos!! wonderful pictures!! love the hedgeapple…the best color of green. I am always checking out where my neighbors are before I head out to take pictures!! The colors, textures and juxtaposition of fancy with rustic make for a fabulous composition. Well done! I’m your newest follower. Please stop by and say hi. Pam, I know my neighbors call me the crazy lady on the corner. I am always bringing home strange things and photographing them in the yard. Love the cute silver dish and the birdhouse. I would love for you to drop by and enter my giveaway. hey, a girl’s gotta do what a girl’s gotta do, right! Your photos are always wonderful! 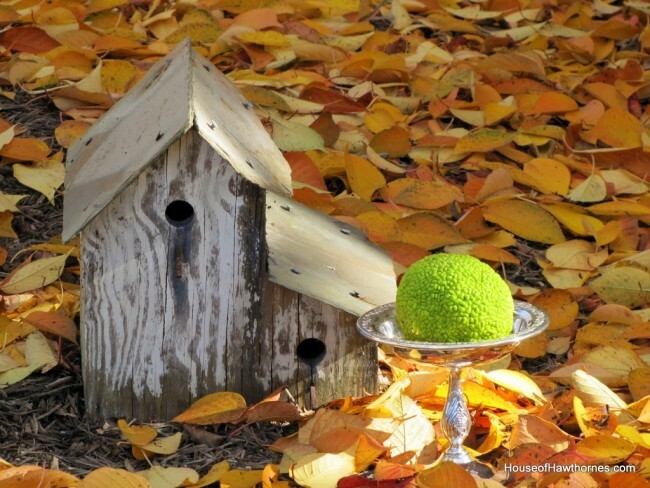 Love the silver with the birdhouse, rustic and elegant, great combo!